I like to wake up early in the morning and accomplish miracles like making breakfast or reading a book and this one morning I was so into The Hobbit I wrote a poem, as follows. I wanna spend the day with Bilbo. walking all through the Shire. I wanna spend the night with Bilbo. as I run my hands through your hairy feet. put dat Ring to Rule Them All upon my finger. Now I am your precious. Ohmygosh this is quite possibly the most awesome thing ever! Your poem is just amazing! A++!!!!!!! i would like to join you on your walk in middle earth plz. Lol! Yes, he seems so jolly, happy, full of life! He can sing song talk to me all day long! Merry dol, derry dol, and such! 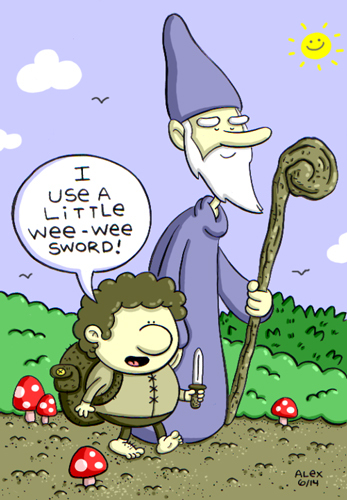 Very sweet, but I really hope that sword is not for wee-wees or you won’t get too far!